To be honest this book has been on to be read list for a few years. But every time I went to read it, I always ended up starting something else. But over the last year I have read 11 books by Matthew Kelly and it was time to work through this one. The interesting thing is once I overcame the resistance to start it I could not put it down. The book is easy to read, but will take a lifetime of effort to apply. The book is about becoming engaged so that we can be used by God as tools to engage and challenge others. Like much of what I have read by Matthew Kelly the key teaching is about becoming 'the best version of yourself.' And through that process being a better witness and servant to God, the church and others. The first paragraph of this book is: "Transforming people one at a time is at the heart of God's plan for the world. It is also essential to developing dynamic marriages, loving families, vibrant parish communities, thriving economies, and extraordinary nations. If you get the man right (or the woman, of course), you get the world right. Every time you become a-better-version-of-yourself, the consequences of your transformation echo through your marriage, family, parish, nation, and beyond to people and places in the future. It is God who does the transforming, but only to the extent that we cooperate. God's grace is constant, never lacking. So our cooperation with God's desire to transform us is essential; it is the variable. Are you willing to let God transform you?" In many ways this book is like an 80/20 analysis of the church. But Matthew focuses on a 7%; for that is the number that keeps coming up in his research. Matthew Kelly walks us through what vibrant engaged Catholics look like and what makes them different from the rest of the Catholics in the pews on Sunday's or who only attend occasionally. From Matthews research 7% of Catholics are doing 80% of the work in parishes and ministries. But his challenge and I believe one of the primary focuses of The Dynamic Catholic Institute is to grow that 7%, even if just by 1% a year. 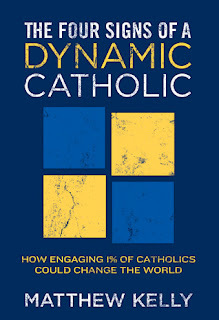 Matthew states: "If just 7 percent of Catholics are accomplishing more than 80 percent of what we are doing today, imagine what 14 percent could do. Not to mention what 21 percent or 35 percent could accomplish. Our potential is incredible. The Catholic Church is a sleeping giant. We literally have the power to change the world." One of my favourite Matthew Kelly quotes is "Most people overestimate what they can do in a day, and underestimate what they can do in a month. We overestimate what we can do in a year, and underestimate what we can accomplish in a decade." by Matthew Kelly from the book The Long View, This book and most of Matthews work for the church focuses on that long view. Engaging 1% more each year, until after a decade we have a force capable of transforming the world. 1. Dynamic Catholics have a daily commitment to prayer. "The 7% have a daily commitment to prayer, a routine. Prayer is a priority for them. They also tend to have a structured way of praying. Many of them pray at the same time every day. For some it means going to Mass in the morning and for others it means sitting down in a big, comfortable chair in a corner of their home or taking a walk, but they tend to abide by a structure." 2. 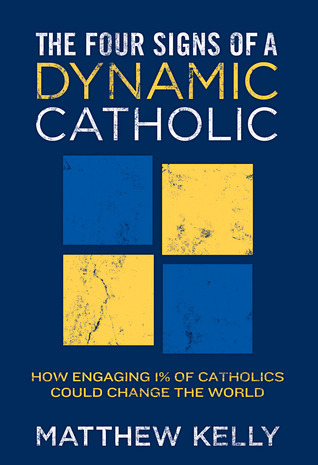 Dynamic Catholics are continuous learners. "Jesus doesn't just want followers. He wants disciples. To be a Christian disciple begins by sitting at the feet of Christ to learn." 3. Dynamic Catholics are generous. "The 7% are universally described as being generous, not just with money and time, but with their love, appreciation, praise, virtue, and encouragement. They see generosity as the heart of Christianity and the proof that the teachings of Christ have taken root in their lives." 4. Dynamic Catholics invite others to grow spiritually by sharing the love of God with them. "Though they don't consider themselves to be actively evangelizing, they are constantly trying to help people develop vibrant spiritual lives by discovering the genius and beauty of Catholicism." Each chapter of this book is structured the same. There is a main teaching section. This is followed by a chapter summary and then key concepts. The teaching of the chapters is condensed into a page or 2 and then a few key points. This triple repetition of the main teachings really hammers home and helps to reinforce the main teaching. I believe this book is more than worth the price and the time just for the chapter on prayer. At the beginning of this chapter Kelly states "When I am spiritually healthy, nothing bothers me." And from the many personal examples he gives it proves true. I know from my own experience, if I pray the Rosary while walking to work the day always goes better than if I miss it and end up praying it later in the day. This chapter emphasises a routine in prayer, but it is not a 6 step plan. It highlights many key practices and structures and lets you figure out the best for you. Having been intentional and reading over 70 Catholic books this year. I have a love of study. But what I appreciate most about the chapters on study if that it is not just about finding truth. It is more about facing the truth and working hard to follow it. The generosity challenge really hit me in this book. Most people especially living pay check to pay check cannot immediately jump to giving 10% or a tithe. Their budget just cannot support it. But Matthew Kelly has a 1% challenge, he states: "So, this is my challenge to you. I call it the Generosity Challenge. Take some time over the next week or two and calculate what you gave to your church, charities, and people in need last year as a percentage of your annual income. Once you have that number, I challenge you to give one percent more of your income this year than you did last year. Furthermore, I challenge you to increase this giving percentage by one percent of your income each year until you reach a tithe of 10 percent (or until it simply is not possible or prudent for you to give any more). Goals bring out the best in us. We have goals for everything else; isn't it time we had some generosity goals?". And the Fourth sign is evangelism. Kelly says" Throughout the Win and Build stages, one of the things that happens to people is that they start to feel good about being Catholic. We don't talk anywhere near enough about this. In the context of a theological discussion or Church governance this might seem a little soft, but it is absolutely essential to the life and growth of the Church. Highly engaged Catholics feel good about being Catholic. They are inspired Catholics." As I mentioned at the beginning, I encountered great resistance every time I went to read this book. In fact in sat on my to be read shelf for a few years. But once I picked it up I could not put it down. This book is an incredible read and I highly recommend it!